this is not very exciting, but I finally put the binding on this doll quilt. I like it much better now, and my daughter has even agreed to let me hang it on her wall! 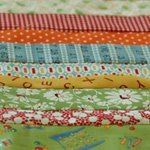 I do have something exciting to share...I'm giving away some goodies (quilt kit!) from my etsy shop over at a room somewhere. Hurry go check it out and enter to win. girl, you are a color wizard. i love this! those half square triangles look pretty teeny...yikes! i entered and now i'm crossing all my fingers, toes and other assorted appendages! Oh my gosh this is so cute and tiny. Look at those triangles! The blue dot is striking in the quilt. It really sets off the half triangles well. It couldn't be cuter! It looks exciting to me. I love all those little triangles, especially because I didn't have to sew them all together! It's fabulous. this turned out really cute! the binding really pulled it all together! 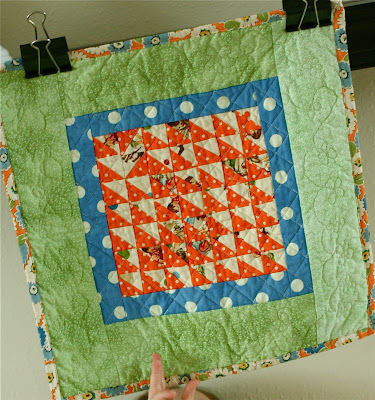 you have got me thinking about mini quilts now too! :) i made some simpler ones and sold those in my etsy shop. are you going to sell some? i like all the ones you have made. i think a wall display would be cool!